The Indypendent’s events calendar comes out every Wednesday online and once a month in print. We provide this calendar as a service to the communities we serve in the New York metropolitan area. Sign-up for our regular e-newsletter and you won’t miss a thing. If there is an event you want others to learn about, let us know. An international survey of films by female cinematographers, including in-person appearances and free talks. See the full schedule visit filmlinc.org/femalegaze. Named for the Nigerian Yoruba goddess of freshwater, pleasure and love, OSHUN is an independent hip-hop/soul duo and the sonic manifestation of Afrofuturism. 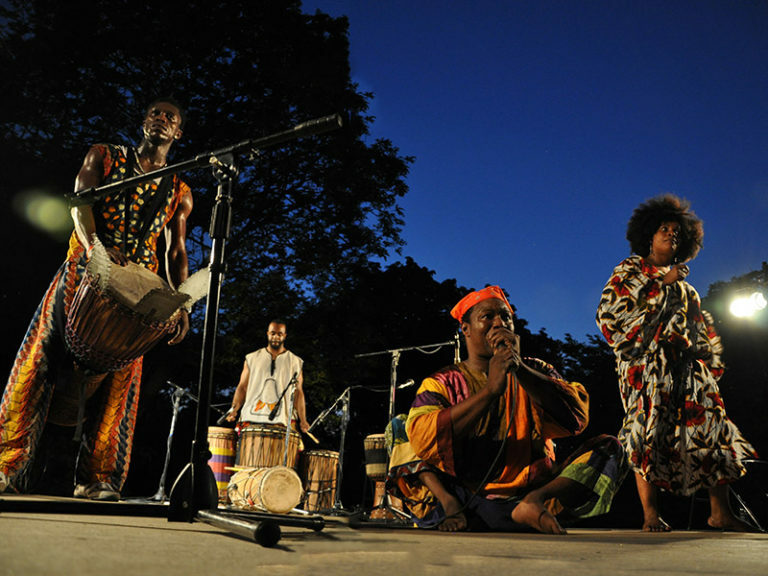 They bring their digital and acoustic sounds, heavy drums and bass and ambient harmonic textures to MoMA’s sculpture garden as part of this summer concert series. Regular Museum admission applies. Talented independent filmmakers from around the globe telling stories that haven’t been done to death by your average Hollywood filmmaker. Festival profits are shared with the filmmakers chosen to participate. Explore deals made in the shade by those packing heat with the Anti-bourgeois Summer Reading Group. Join them weekly to discuss classic works of noir fiction through a Marxist lens. Visit marxedproject.org for a reading list. Despite a right-wing Presidency and the influence of the Catholic Church, Argentina is on the verge of legalizing abortion. Legalization narrowly passed the lower house of Congress in June after over a hundred thousand people organized a massive protest in front of Congress. Now we are weeks away from the vote in the Senate. Hear from two socialist feminists from Argentina and reflect on how to organize for free and legal abortions in the United States. Sing along to your favorite punk diddies with a live band backing you up. A mobile art center inviting visitors to engage with culture from across the Caribbean diaspora. Visit Thursday evenings and Saturday afternoons for special programs. Commemorate the 30th anniversary of the Aug. 6, 1988 Tompkins Square police riot with the Museum of Reclaimed Urban Spaces. For its 50th birthday celebration, the Center for Traditional Music and Dance calls upon some of its favorite artists. Among the guests are klezmer pioneer Andy Statman, Irish-American supergroup Cherish the Ladies, the groundbreaking Afro-Colombian band Grupo Rebolu and the miraculous Guinean dancer, drummer, and singer Sidiki Conde and his group Tokounou. A new series featuring internationally renowned musicians, free art-making classes and lawn games at the Queens Museum. This week brings Innov Gnawa, a Grammy-nominated musical collective dedicated to exploring Morocco’s venerable gnawa music tradition, to Flushing Meadows. A multi-disciplinary show that explores the intersections of creative expression and gender politics. Featuring performances by: ELSZ, Anju Madhok, Ashni Davé, Anjna Swaminathan, Dee Mandiyan, Shriya Samavai, Kiran Bath, Zadian Madhuri, Dheiva Moorthy, Debayani Kar and the Assemkala Initiative. Alexandria Ocasio-Cortez and Ady Barkan host a community discussion on keeping families together, single-payer health care, environmental racism, restorative justice and other pressing issues. Thirty-five singers and musicians with their secular preacher, Indy columnist Reverend Billy, belt out a message of radical social justice and environmental healing. This improbable blend of soulful gospel and surrealistic humor somehow works! On Tuesday, the choir reports back from Athens, Greece where they marched with refugees from Syria, Palestine and Sudan. Photo (top): Sidiki Conde and others celebrate the 50th anniversary of the Center for Traditional Music and Dance on Sunday. Credit: Deborah Ross.